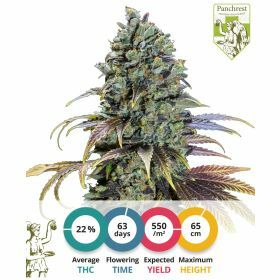 Cream Caramel is a three-way cross of various potent indica-dominant hybrids, namely: Blue Black, Maple Leaf Indica and White Rhino. The vigorous growth potential and sweet and spicy taste of Cream Caramel cannabis seeds have made it a popular strain for growers all over the world. Cream Caramel is an exotic strain from which a beginner can harvest triple A quality bud with ease. The yields of the plants that grow from these Cream Caramel cannabis seeds are far above average for a strain with an unusual smell and taste like this one.